Introduction: Basal cell carcinoma (BCC) is the most common malignant neoplasm in the skin and is considered to have a low degree of malignancy. BCC is invasive but rarely metastatic and originates in hair follicle-derived cells or interfollicular zones of the epidermis. Trichoblastoma (TB) is an infrequent benign skin neoplasm that differentiates toward follicular germinative cells. Both of these cutaneous lesions comprise nests of basaloid cells, and because the differential diagnosis is hard to obtain between them histologically due to their similarity, the correct diagnosis must be established. Materials and Methods: The sample size of this descriptive study consisted of 20 cases: 10 paraffin-embedded tissues that were diagnosed with carcinoma of solid basal cells with follicular differentiation and 10 TB tissues. The diagnosis of all samples was confirmed morphologically with hematoxylin and eosin. One-micron-thick sections were cut from each sample and analyzed semiquantitatively by immunohistochemistry (IHC). Differences in staining between BCC and TB were analyzed by Chi-square test. Results: Two of 10 TB cases were positive for Ki-67 versus 10 of 10 BCC samples. Cytokeratins 6 was expressed in 1 of 10 TB samples and in all BCC tissues. Staining with clone 34BE12 generated signals in all lesions at various intensities. Conclusion: The diagnosis between TBs and BCCs must be made histologically, because the treatment of BCC is radical and can compromise aesthetics and function, even for experienced pathologists. Because their morphological diagnosis is difficult, the histopathology results must be supported by an IHC panel. Background: Androgenetic alopecia (AGA) is the most common form of hair loss in men and in women. Currently, minoxidil and finasteride are the treatments with the highest levels of medical evidence, but patients who exhibit intolerance or poor response to these treatments are in need of additional treatment modalities. Objective: The aim was to evaluate the efficacy and safety of low-level laser therapy (LLLT) for AGA, either as monotherapy or as concomitant therapy with minoxidil or finasteride, in an office-based setting. 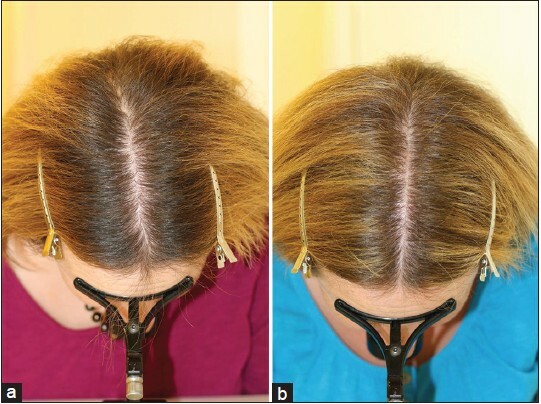 Materials and Methods: Retrospective observational study of male and female patients with AGA, treated with the 655 nm-HairMax Laser Comb ® , in an office-based setting. Efficacy was assessed with global photographic imaging. Results: Of 32 patients (21 female, 11 male), 8 showed significant, 20 moderate, and 4 no improvement. Improvement was seen both with monotherapy and with concomitant therapy. Improvement was observed as early as 3 months and was sustained up to a maximum observation time of 24 months. No adverse reactions were reported. Conclusions: LLLT represents a potentially effective treatment for both male and female AGA, either as monotherapy or concomitant therapy. Combination treatments with minoxidil, finasteride, and LLLT may act synergistic to enhance hair growth. Context: Although evidences for association of androgenetic alopecia (AGA) with metabolic syndrome (MetS) are accruing, inconclusiveness with respect to the gender specificity and differential association of MetS with increasing severity of AGA continues to persist. Furthermore, data specific to Indian settings are relatively sparse. Aims: The present study aimed at assessing the frequency of MetS in individuals with early AGA in Indian settings. Settings and Design: A case-control study was conducted at a trichology clinic in Bengaluru between April 2012 and September 2012 with a total of 85 cases of AGA and 85 age-matched controls. Materials and Methods: The Norwood-Hamilton classification was used to assess the grade of AGA. MetS was defined according to the National Cholesterol Education Program Adult Treatment Panel III criteria. Blood pressure, blood glucose, lipid parameters, and body mass index along with anthropometric measurements were assessed in all study participants. Statistical Analysis Used: Chi-square test was used to compare proportions between groups. Means were compared between groups using Student's t-test. Results: MetS was seen in a higher proportion of patients with AGA (43.5%) as compared to the control group (2.4%) and the differences were statistically significant (P < 0.001). As compared to controls, patients with AGA had higher triglycerides (P < 0.001), systolic blood pressure (P < 0.001), diastolic blood pressure (P < 0.001) along with significantly lower high-density lipoprotein cholesterol levels (P < 0.001). Severity of AGA was not associated with MetS. Conclusions: AGA is associated with MetS in male Indian patients aged <30 years. Studies with large sample sizes may be required to conclusively define any putative associations between AGA grades and MetS. Aims : The aim was to study the trichoscopy features of selected hair and scalp conditions by two dermoscopic devices with different modes that is, polarized (noncontact) and nonpolarized (contact) mode. Materials and Methods : The present study included 11 clinical varieties of cases with total 112 patients, attending Sir Takhtasinh Hospital, Bhavnagar in the last 2 years. The clinical history was recorded for each case, and images were taken in both the Heine and DermLite II pro dermatoscope. We used polarized mode of the noncontact device (DermLite II) and the nonpolarized mode of the contact device (Heine) for our study. Statistical Analysis Used: Fisher's exact test to study dermoscopic observations for each mode. Results: We observed different nonscarring alopecia cases such as alopecia areata, androgenetic alopecia, trichotillomania, and tinea capitis. Scarring alopecia included discoid lupus erythematosus, lichen planopilaris, pseudopelade of Brocq, systemic lupus erythematosus. Scaling disorders included the psoriasis and seborrheic dermatitis. Furthermore, infestations like pediculosis capitis were included in the study. Various features were divided into follicular, interfollicular, pigmentary, vascular and hair shaft patterns. Each of the features was correlated in both the Heine (nonpolarized) and DermLite II (polarized) dermoscope, and observational finding was put forward accordingly. 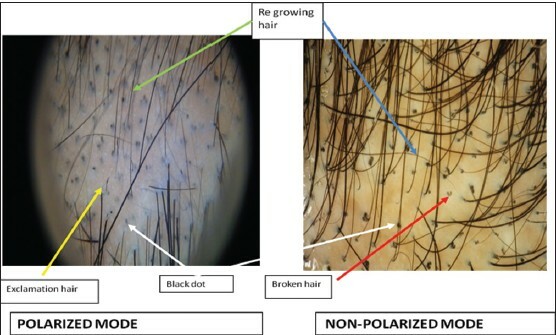 Conclusions: Various variations were observed in the documentation of dermoscopic patterns of the two dermatoscopes with certain features such as vascular patterns, scaling, and reticular pigmentation being better appreciated in polarized mode, while certain features were better documented in nonpolarized mode that is, black dots and tapered hair. Sarcoidosis affects different systems of the body including the skin where it can affect various cutaneous sites. 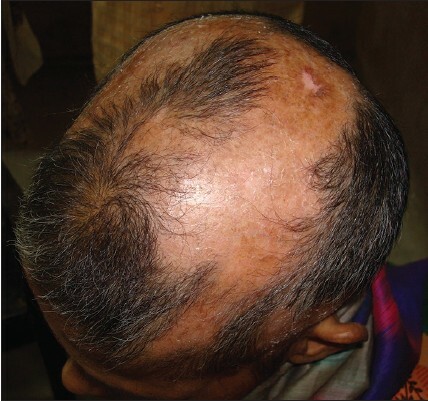 Among these sites, the scalp is a very unusual location for lesions of sarcoidosis. Sarcoidosis of the scalp can very rarely be accompanied by cicatricial alopecia. 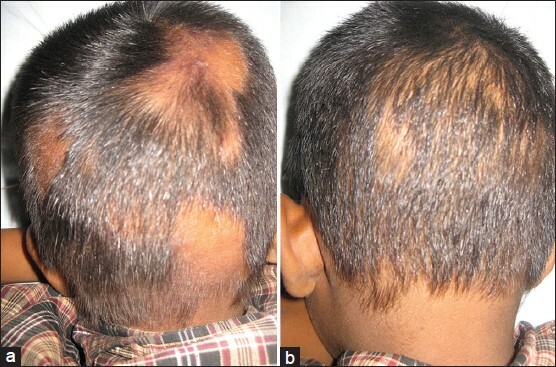 We report here a rare case of sarcoidosis of scalp with cicatricial alopecia. To the best of our knowledge, this is the first such report from India. Alopecia areata (AA) is a T cell mediated autoimmune disease with multifactorial etiology resulting in partial and total nonscarring alopecia. We hereby report a case of two brothers (aged 7 and 5 years) presenting with coincidental AA over scalp which is a rare presentation. Plica polonica is an acquired condition characterized by irreversible matting of hairs. It has been most commonly reported in association with psychiatric disorders. 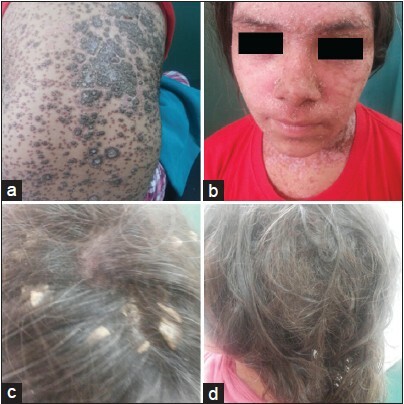 Here, we report a case of felting in rupoid psoriasis in a 13-year-old female. Parry-Romberg syndrome is a rare neurocutaneous syndrome characterized by progressive shrinkage and degeneration of the tissues beneath the skin, usually on one side of the face. It is associated with neurological disorders such as trigeminal neuralgia, facial paresthesia, headache, and focal epilepsy. Concomitant occurrence of discoid lupus erythematosus (DLE) and morphea in the same skin lesion is exceptional, defined as overlap syndrome with two or more different connective tissue disease concurrently or consecutively. 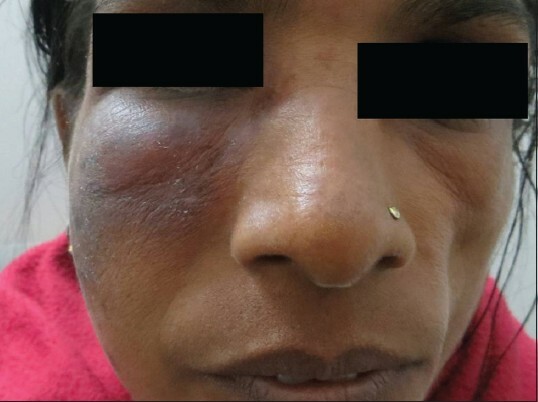 A 32-year-old female developed DLE on a long-standing lesion of scleroderma over left temporal area with characteristics histopathological changes. She was treated with oral antimalarials and steroids which halted the progress of the disease. A middle-aged man presented with anterolateral leg alopecia which is a very common but under-recognized hair loss condition. Trichotillomania (TTM) is an impulse control disorder characterized by repetitive behavior of hair pulling resulting in secondary alopecia. It is among the psychocutaneous diseases known to be associated with psychiatric comorbidity, social, and functional impairment. Although most of the time, an experienced dermatologist easily recognizes the key features of TTM, a history and physical examination alone might not be enough to make a definitive diagnosis. As an effective noninvasive technique for the evaluation of scalp and hair diseases, trichoscopy also has proven to be a valuable tool in the diagnosis of TTM. Currently, new trichoscopic findings of TTM have been described. 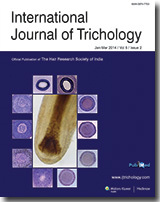 Here, we report a case of TTM with recently defined trichoscopic features. Diffuse partial woolly hair (DPWH) is an uncommon pilar dysplasia defined by the presence of two hair shaft populations with wooly hairs distributed diffusely among normal hairs throughout the scalp. So far the condition has been reported as an isolated disorder with familial occurrence. We report a case of DPWH in 35-year-old female patient with epidermolysis bullosa with mottled pigmentation. Hair and scalp disorders commonly seen in the African female have been associated with hair care practices. Distal trichorrhexis nodosa (TN) has been commonly reported with various forms of trauma to the hair from hair grooming practices. 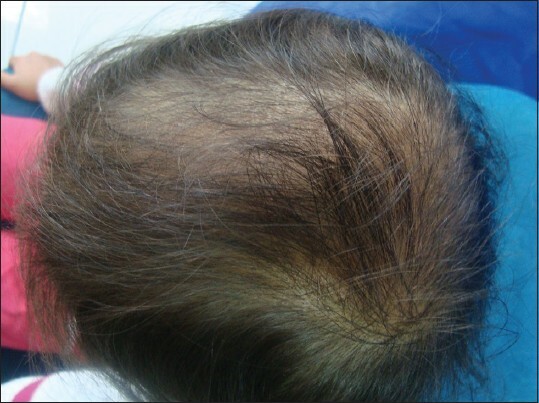 We report the case of recurrent generalized hair loss resulting from proximal TN in a 28-year-old Nigerian female with atopy. The use of chemical relaxers precipitated each episode of hair loss. Generalized proximal TN has been reported in those of afro Caribbean descent. 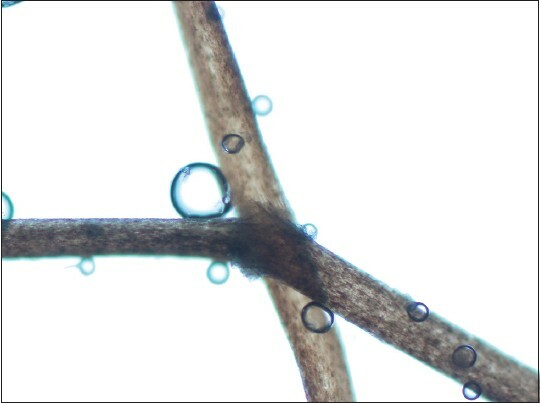 The acute nature and extent of the hair loss suggest there may be some underlying structural defect in such individuals.